“The EU costs us £350 million per week” – in reality, according to government figures, in 2015 the cost to the UK (what we sent them minus what they sent back) was £135 million a week. “The EU is expanding to include: Albania, Macedonia, Montenegro, Serbia and Turkey” – this is not going to happen any time soon, and if it did the UK would have a veto over it. “Brexit would bring … the ability to dump the European Convention on Human Rights” (this assertion is attributed to Sir Richard Dearlove) – the ECHR is of course not an EU body, though it is true that the EU treaties require countries to sign the ECHR. Given that the UK was the first country to ratify the ECHR, in 1951, before the European Economic Community even existed, it is unlikely that the UK would want to leave it. Presumably the Vote Leave campaign knows these statements are false or misleading, and they don’t care. When did it become acceptable in Britain for a mainstream political campaign to say things which they know to be untrue? I do understand that the the public is disgruntled with politicians and technocrats, and Vote Leave are exploiting this opportunity to say things that they know to be untrue or misleading, expecting that the public will have little sympathy with “experts” who try to put a more factual, evidence-based or nuanced view. In this respect, they are pursuing the same kind of campaign as Donald Trump, who has recognised that popular dissatisfaction with the establishment gives him room to lie and to stir up all kinds of hatred and prejudice. In my view it is very dangerous for any society to allow this kind of populism and disregard for the truth to take hold. But in the end I am a technocrat – working in a think tank and in a university – so all I can do is continue to do what I know how to do, which is to try to share what I know and what the evidence and expert opinion tells us. I have annotated the leaflet, highlighting where the leaflet is factually wrong and explaining the issues as I see them. I would welcome comments. Generally good points, but the ECHR point is much weaker than the rest. The Dearlove comment on Brexit enabling dumping ECHR is arguably correct. Although ECHR is not in itself an EU creation, ECHR compliance was embedded into EU membership by article 6(2) of the Maastricht Treaty. So for UK to walk away from ECHR would also be a breach of Maastricht, a barrier which Brexit would eliminate. You have blacked out your name and address on your web page but left it on the item to which you link! Oops: thanks. I’ve now blanked it out (but it may take a few minutes for the cached version on the web to update). Thanks for letting me know. A figure of £135 m per week is the lowest in the range of estimates I’ve seen, so I think you should provide a source and/or working out. Btw, on Twitter the tag-line for this post is “in which I fact check today’s Vote Leave leaflet”. A lot of your annotations, while valid and worth mentioning, are nevertheless judgement calls. So I think if we are all interested in truthiness it is misleading to bill it as such on social media. I have given both shown my working and given the source of the figures. I agree, it might be different in different years. And your testimony is to be believed because….? Because I set out as much as possible the sources of information I cite; and because I have no reason to mislead. But you should read what I say and decide for yourself. Jonathan – Thanks for sharing your opinions on this matter. Do you think that your goal of getting Britain out of the EU justifies the use of misleading and inaccurate information? Or are you uncomfortable with the way the leaders of your side of the argument are misleading the public. I regard myself as an independent expert, and I do not benefit from EU money (sadly). Albania, Macedonia, Montenegro, Serbia and Turkey are all candidate countries and some are negotiating membership. So, it is not untrue. This is interesting, but it misses the point that in so much of this debate, it’s not as simple as true or false. For example, the statement that the EU is “expanding” to include Turkey, Macedonia etc is not false in and of itself, since they all have candidate country status and it is British government policy to support their accession. But it is potentially misleading, since everyone in the know agrees that it won’t happen for another 5-1o years at least, and free movement will come a few years after that. Similarly, in my opinion, to use the £350m a week figure is just as acceptable as the £135m figure you use. It depends on the exact statement you’re making. So to say “Brexit would free up £350m a week for the NHS and our priorities” is demonstrably untrue, but to say “£350m a week is our official gross bill for EU membership and is the total amount that we lose control of as members” is debatable, but not untrue. Most of the time I see Vote Leave spokespeople explain it well and truthfully. Using the word “cost” here is misleading, but the leaflet does state that around half of the money comes back (although your right that “we have no control over how it’s spent” is untrue with respect to the rebate). A few other things. The “Common Market” was the commonly used shorthand for the EEC. See the 1975 referendum ballot paper. As another commenter said, the ECHR is an issue in this referendum, since it would be legally very difficult to withdraw from the ECHR while being an EU member, due to the Lisbon Treaty. Your claim that workers’ rights legislation was part of a European effort to prevent a race to the bottom seems surprising, and I’d be keen to see some evidence for that. Your point that British exporters will still have to obey European rules when they export is the weirdest. Exporters from any country to any other country have to follow the domestic country rules! They don’t seek to have a say over them. Finally, your points on sovereignty are misleading. The statement “EU law does not override UK law” is clearly untrue since the Factortame case as any lawyer will tell you. While we are members, the ECJ can strike down any measure by the British Parliament. This is the key point which sets the EU apart from other organisations like NATO. Of course, we can leave – that is the only chance to regain our sovereignty. Moreover, leaving via repeal of the ECA would be legally difficult. Britain will almost certainly leave via Article 50 of the Lisbon Treaty. If we remain, the next treaty might not have a withdrawal clause. So overall, you’ve criticised Vote Leave for misleading (rightly in some cases) but in doing so have yourself misled. Most of the rest of your points are, like another commenter said, “judgement calls”, which brings me back to my original point that most of this debate cannot be simplified into true and false. So calling this a fact checking exercise is wrong. PS: Margaret Thatcher was not Prime Minister in 1993. Thanks Peter. I agree: some of this is not as simple as true or false, but a matter of interpretation. I don’t think I have “misled” – except for your excellent point that Mrs T was no longer PM by the time the Single Market, which she negotiated, came in to force. I have updated the annotations to try to clarify several of the points you pick up – in a way which I hope you think is fair and honest. 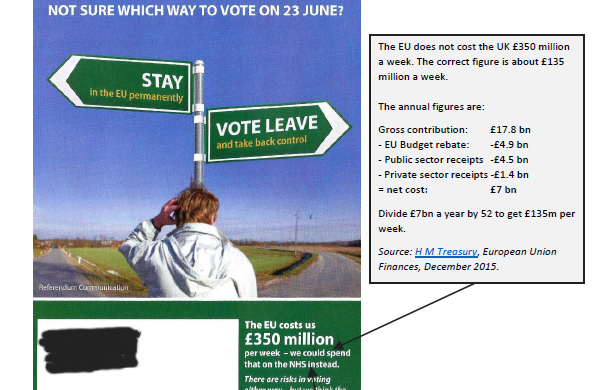 I stand by the original point that the Vote Leave leaflet is deceitful. Previous Previous post: Do middle-income countries really get more aid than low-income countries? Next Next post: Whose aid is most effective? Are generous donors less effective?